I picked this magazine up because clearly I am crazy. This Jane Austen obsession is becoming all consuming. I can’t even knit but the projects in this magazine are so enticing that I could not resist. I want to learn and I am told that learning to knit is not that difficult. So perhaps I will give it a go if only because I really, really want a knit Spencer to go with my Regency day dress. But perhaps, it is best if I start off simply beginning with a scarf or a pair of mitts. 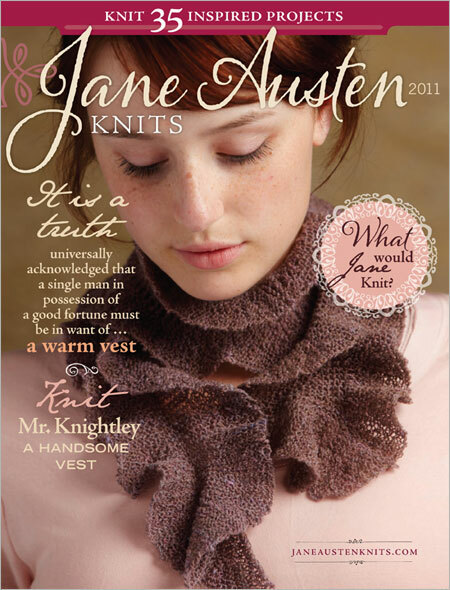 Did Jane Austen knit? And if she did, what would she have knit? In a period before industrialization it is not unlikely that women knitted blankets, shawls, scarves, cushions, and stockings. Austen makes mention in Sense and Sensibility Mrs. Jenning’s plans for a knitting project and in an 1807 letter she describes her own knitting of a lap rug. Martha’s rug is just finished, & looks well, tho’ not quite so well as I had hoped. I see no fault in the Border, but the Middle is dingy.–My mother desires me to say that she will knit one for you, as soon as you return to chuse the colours & pattern. The knitting of stockings was an undertaking easily employed by the poor to supplement their meager incomes. It is probably not an unlikely supposition that Jane Austen and her sister, as daughters of a clergyman, may have knitted stockings for charitable distribution amongst the impoverished members of their village. And besides, how can one not want to undertake some of these very beautiful pieces?